Solar System: Sun. Creation Testifies! 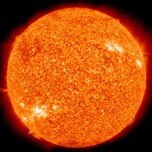 At the heart of our solar system is the Sun, a stable hydrogen "bomb" that gives off more energy every second than a billion major cities would use in an entire year. The Sun is remarkable in its complexity and power. When we examine the science of the Sun, we find that it confirms biblical creation. The Sun and other luminaries in the sky were created on the fourth day of the creation week. Genesis informs us that the purpose for these lights in the sky is (1) to separate day from night, (2) to help us mark the passage of time, and (3) to give light upon the earth (Genesis 1:14-15). A fourth purpose is revealed elsewhere in Scripture — to declare God's glory (Psalm 19:1-6). But two of these purposes are accomplished almost entirely by the Sun. The Sun alone separates day from night. The Sun and Moon are both described as "great" lights in Genesis, perhaps because they appear far brighter than any other lights and also because they appear as large disks, whereas all the other luminaries are visible as points with no discernible size. The Sun is the greater of these two, being far brighter than the Moon and having its own internal power source. The Moon is the lesser great light, being far dimmer than the Sun and receiving its power to illuminate from the Sun itself. The Moon shines only by reflected sunlight. A fifth purpose of these two heavenly lights is given in Genesis 1:16 — to "govern" the day and the night. The Hebrew word rendered as "govern" or "rule" means to have power or dominion. The Sun can be said to have "power" over the day because it defines the day and overpowers all other luminaries during the day. It may appear small in our sky at a distance of 93 million miles, but the sun is actually 109 times the diameter of Earth and over a million times the volume of Earth. The Sun is the largest single object in our solar system and comprises 99.86 percent of all its mass. If a ten-pound bowling ball represented the mass of the Sun, then all the planets, moons, comets, and everything else in our solar system could be represented by the combined mass of one nickel and one penny. Jupiter would be the nickel. The Sun is comprised almost entirely of hydrogen and helium gas. The solar core is the hottest region of the Sun, with temperatures exceeding 15 million degrees Celsius (27 million degrees Fahrenheit)! Astronomers classify the Sun as a main-sequence star. The Sun's temperature and distance from Earth are ideal for life.